Helmet mounted visor holder. Visor for attachment here is sold separately. 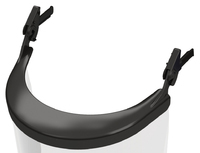 Polycarbonate replacement visor protector. 8”(20cm) length. 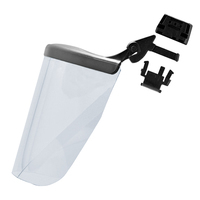 For attachment to 1004583 helmet visor carrier. Carrier needed for attachment here is sold separately. 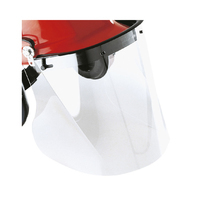 Polycarbonate replacement visor protector. 8”(20cm) length. 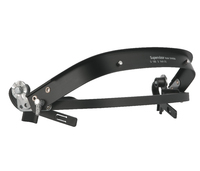 For attachment to Surefit FVVC helmet visor carrier. Carrier needed for attachment here is sold separately. 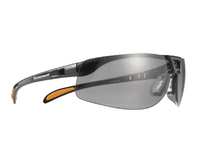 HONEYWELL MILLENNIA 2G Safety Glasses offer panoramic viewing area to see more both frontally and peripherally while working. Less “frame interruption”, which is a typical complaint from end-users when trying to look towards the left, right, above and below to see clearly in all directions. A greater lens coverage wrap both peripherally and along the cheeks helps prevent particulate risk. 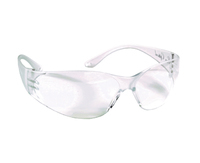 EN166 2C-1.2 HON 1 FT K N.
Safety glasses combining sport styling with lightweight comfort and flexible design. Floating lens design offers increased flexibility with a secure wraparound brow that expands to fit a wide range of users. TSR grey lens gives addition protection in sunlight. EN172 EN166FT. Bolle Slam Glasses with Clear Anti Mist Lens. Stylish and easy-to-wear, the SLAM model provides protection at all times while offering unbeatable comfort. Wrap-around fit, All-round vision, Comfortable straight temples. EN166F EN170. BOLLE glasses with "Metal" frame, 160% Flex temples, Non-slip TIPGRIP temples, Adjustable non-slip pads, Anti-static, EN166F EN170. Bolle Slam Glasses with Yellow Lens. Stylish and easy-to-wear, the SLAM model provides protection at all times while offering unbeatable comfort. Wrap-around fit, All-round vision, Comfortable straight temples. EN166F EN170. The Bolle Contour ESP has polycarbonate Lens, Non-slip TIPGRIP temples, Anti scratch - Anti Fog lens, Filters 100% UVB/UVA, Lightweight, EN166F EN170. The Bolle Chopper has clear ESP Lens. Chopper is the ideal model for optimum protection and comfort. With its ten-base frame, Chopper will offer you the best protection for any situation. Lightweight, wrap-around fit, All-round vision, Comfortable, straight temples. EN166F EN170. Bolle Axis safety glasses with Polycarbonate Lens, Non-slip TIPGRIP temples, Adjustable non-slip bridge & pivoting temples, Anti scratch - Anti Fog lens, Absorbs UVA & UVB Light, Polycarbonate Lens, EN166F EN170. Bolle Chopper Glasses with Clear Lens. Chopper is the ideal model for optimum protection and comfort. With its ten-base frame, Chopper will offer you the best protection for any situation. Lightweight, wrap-around fit, All-round vision, Comfortable, straight temples. EN166F EN170. Bolle Chopper glasses with Smoked Lens. Chopper is the ideal model for optimum protection and comfort. With its ten-base frame, Chopper will offer you the best protection for any situation. Lightweight, wrap-around fit, All-round vision, Comfortable, straight temples. EN166F EN170. Bolle Chopper Glasses with Yellow Lens. Chopper is the ideal model for optimum protection and comfort. With its ten-base frame, Chopper will offer you the best protection for any situation. Lightweight, wrap-around fit, All-round vision, Comfortable, straight temples. EN166F EN170. The Bolle Trackers is ultra-comfortable and provides protection from all mechanical risks and also chemical risks. Removable foam reinforcement with indirect ventilation, Removable adjustable strap, Side ventilation. EN166FB. EN170.